You would think that after centuries of urban design there would be a checklist of dos and don’ts for urban designers to make sure every new plaza and town square is public friendly. But over and over again, I see millions of dollars wasted on public plaza designs that don’t work, or don’t work as well as they should. This past spring, we visited two downtown public plazas that illustrate some of the dos and don’ts of public space design. We came upon Salt Lake City’s Olympic Plaza almost by accident while wandering the Gateway Mall, a downtown outdoor shopping centre. The Plaza is in the middle of the Mall with no links to the streets and no real sense of arrival. something you would expect from an Olympic Plaza. It is actually a small, intimate space. We DO love the dancing snowflake fountain, which did attract some children to play in it. However we DON’T like the fact that kids can’t play in the inviting man-made stream complete with rocks and trees plaza’s edge. It should have been designed to allow for families to play in the water and climb the rocks. Good public spaces don’t have a long list of things you can’t do! We DON’T like the steep stairs entering the plaza at one side. While the steps may make for good seating at times, it was a huge barrier for young children, older people, and those arriving with strollers, bikes and wheelchairs. We DON’T like that overall; Salt Lake City’s Olympic Plaza feels more like a private space, which supports the commercial retailers of the Gateway Mall. In fact, it is almost identical in scale and scope to a similar dancing fountain and man-made stream plaza in the city’s brand new City Creek Centre shopping mall, just a few blocks away. Salt Lake City's downtown Olympic Plaza with its central fountain. The plaza includes these red rocks and water feature inspired by the Utah landscape. It seems a shame that children can't play in water and climb on the rocks. Public spaces should be design to encourage as many different activities as possible, especially passive activities. Salt Lake City's Olympic Plaza from afar with its small grass area for play. Too often plazas are over designed and have too many different levels. A flat grass space that allows people to play different games is much better than a sea of concrete with lots of steps. Salt Lake City's plaza is lined with shops like European plazas, unfortunately they don't open out onto the plaza. City Creek Centre's plaza and fountain. There is an actual creek running through the shopping centre. Contrastingly, St. George’s Town Square seemed to DO everything right. The Square is right off of Main Street and is visible to pedestrians, cyclists and drivers. The dancing water fountain is front and centre, inviting people of all ages to stop, look and play. Our visit was in late March, and already the weather was nice enough for dozens of children and their families to enjoy the Square. I can only imagine how refreshing this fountain is in the summer when it gets really hot. We DO like that not only the fountain (very similar to Salt Lake’s Olympic Plaza fountain), but also the man-made stream just a few meters away can be played in and enjoyed by everyone. We Do like that there is a picnic area with movable tables and chairs in the middle allowing parents could easily watch their children run from one area to the next. We DO like that there are public washrooms in the immediate area. We DO like that there is also carousel in the square for families to enjoy. It is also priced right at $1 per ride with kids under 42 inches getting to ride free. Not sure what it is about small American cities but many seem to have a carousel somewhere in their Downtown – Helena, Missoula, Spokane and Idaho Falls. (There used to be 5,000 carousels in USA, now there are fewer than 125). There is something fun about the sound and sight of a carousel. 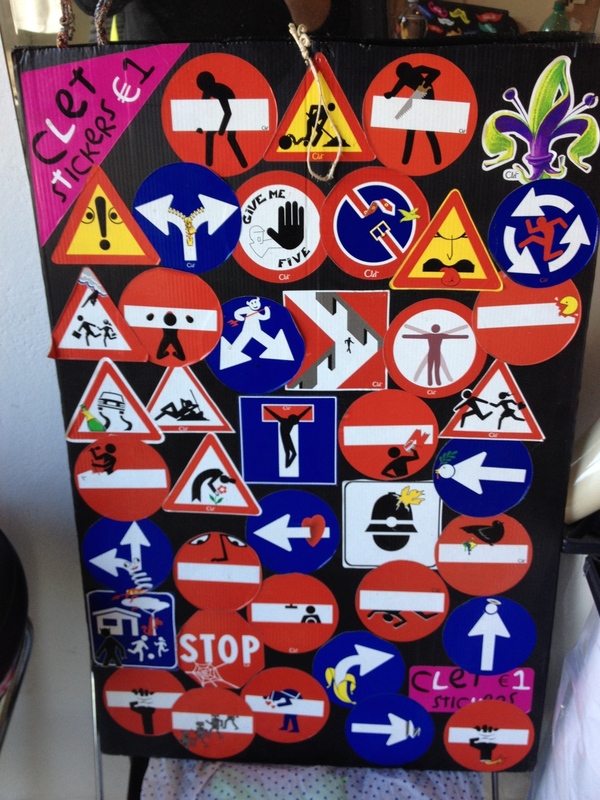 They enliven many urban spaces including Paris, New York City and Lyon. A carousel would be a great addition to Calgary’s Olympic Plaza, Devonian Gardens or the Eau Claire Plaza/Wading pool. We DO like that the square is anchored on three corners by a public buildings, giving it a definite sense of being public. As well, two of the buildings – Library and Children’s Museum – are very synergistic with the family focus of the Square. 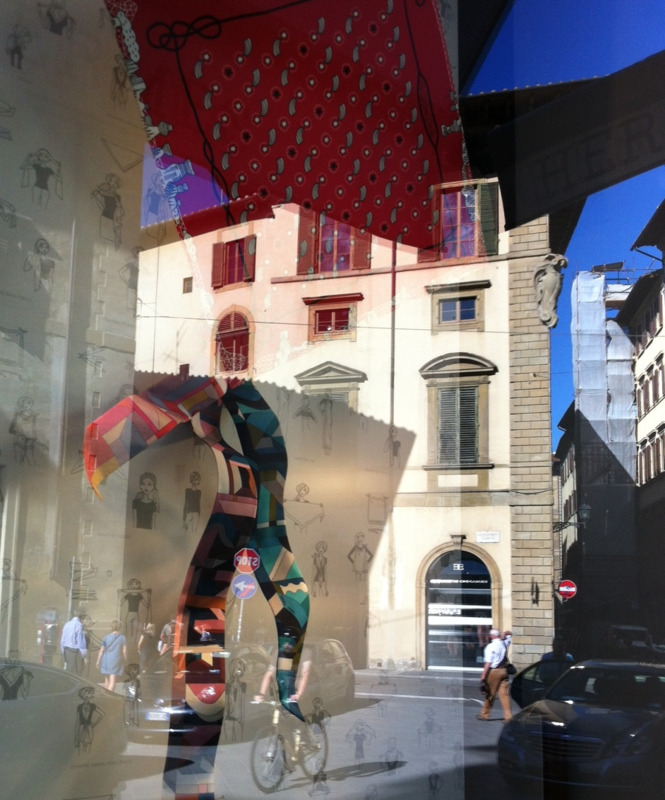 We DO like that the Square and streets around it are home to several small public artworks. In an innovative twist, the sculptures are actually for sale, so they are temporary rather than permanent. So rather than the City purchasing the works of art, the City offers up the square and streets as an outdoor exhibition space on a temporary basis to sell their art. There is even a price list posted at the entrance to the square. We DO like that the square includes a large rectangular multi-purpose grass area that is used for non-programmed activities like throwing a ball or a Frisbee, as well as major programs like movies in the square, arts and craft fair and being the “finish line” for an international iron man competition. St. George’s Town Square was completed in 2007 and designed by Bruce Jorgensen, GSBS Architects from Salt Lake City for $4.5 million. The water fountain is right next to the sidewalk and open to the street so pedestrian and drives can see all the fun being had by the families. Children love to walk, run and jump in the water. Kids are ENCOURAGED to play in the water. Inviting seating area for parent in St. George's Town Square. Great place to watch the kids play, have a chat or even work on your laptop, iPad or phone. The Carousel is just one of several elements that makes St. George's Town Square and inviting public space. One of several, life-size fun sculptures in or near St. George Town Square. Over the past 10 years, Calgary has created dozens of public spaces that are nice to look at but rarely get much use. Poppy Plaza is a good example; this $11 million dollar public space, located on Memorial Drive right next to the Louise Bridge and the busy Bow River pathway, you would think would be a busy place. Yet I have walked, cycled and driven by 100s of times (at various times of day and of the week) and at most, I might see one or two people there and usually they are just passing through. Good public spaces are engaging and allow for multiple uses year-round - they are more than just decoration. Currently there area three new urban public spaces in the works for Calgary’s Beltine – ENMAX Park (on the east bank of the Elbow River, part of Stampede Park’s mega-makeover), Enoch Park (Macleod Trail between 11th and 12th Avenues SE) and Connaught Park (on 16th Avenue between 11th and 12th Streets SW). Over the summer, I hope to meet with the designers of these spaces and share with you what urban dwellers can expect from these new spaces. Poppy Plaza at noon on a beautiful summer day sits empty. The site of the new ENMAX Park at Stampede next to the Elbow River. Putting the park back into parking lots. Calgary's Century Gardens is not public friendly. When designing public spaces designers should be thinking about how to foster activities not restrict them. Kids, get back here you can't climb on those rocks, no wading in the water! Richard White is the Urban Strategist at Ground3 Landscape Architects; this blog reflects his opinions and not necessarily those of Ground3. Since then I have expanded the term to beyond just shopping, especially in the summer when downtown employees’ noon hour thoughts are not only about shopping or lunch, but about getting out for a power walk or a run. Recently, I decide to get out on my bike and check out what happens in Downtown Calgary at noon hour when 150,000+ employees are let out to play for an hour. Power Hour on Stephen Avenue looking west from the +15 bridge connecting TD Square with Bankers Hall. The 300W block of Stephen Avenue is one of the most densely populated blocks in Canada with 200 floors of office buildings. So when the bell rings for lunch, they pour out onto the street like elementary students into the school yard. 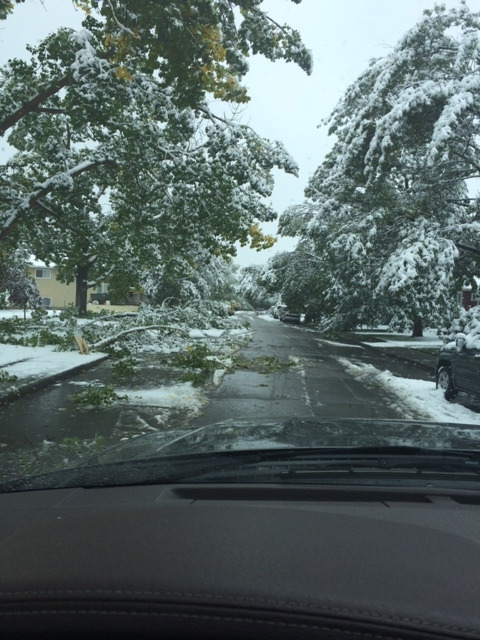 (photo credit: Jeff Trost). This is what the power hour looks like at street level on The Bay block. 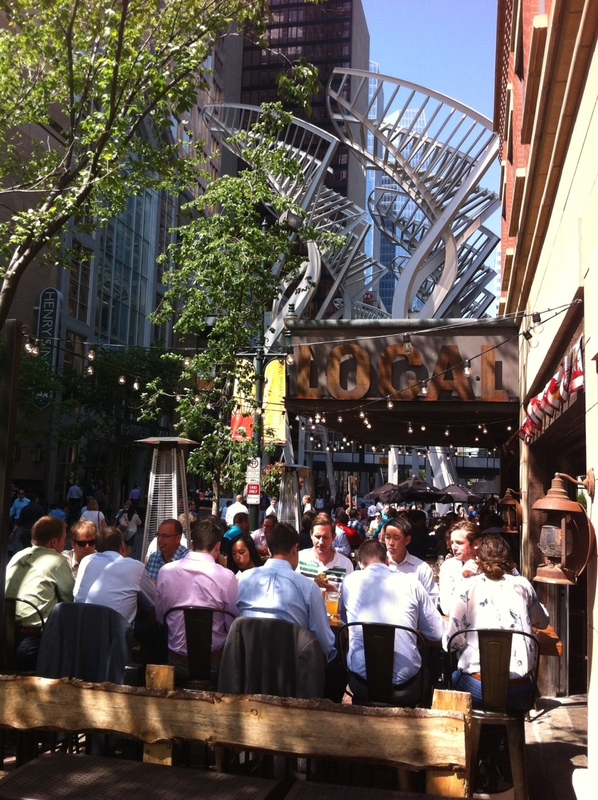 A "power hour" lunch on Stephen Avenue looks more like the board room than the lunch room. Even the kids like to get our for a "power hour" ride. You never know what you will see on Stephen Avenue during the power hour. It is a popular place for marketing promotions and give-aways. In addition to Stephen Avenue Walk, Calgary's downtown "power hour" is also celebrated along the south and north sides of the Bow River on the north side of downtown. Here you will find joggers, power walkers, cyclists, strollers, bladers and skateboarder all mixing and mingling. The Bow River promenade in downtown's Eau Claire district on the north side of downtown is a very popular spot for joggers, walkers and cyclists. The new Calatrava Peace Bridge over the Bow River can become grid-locked during the power hour. The Eau Claire Plaza pool is a popular place for families to meet up during the power hour and have some quality family time. Not everybody love to work up a sweat during power hours, some are happy to just gets some fresh air or meet up with a friend along the Bow River. One of the big advantages of working downtown is that you can easily meet up with family and friends who also work downtown. I just happened to run into an old acquaintance who I hadn't seen in 10 or more years on this everyday trip. 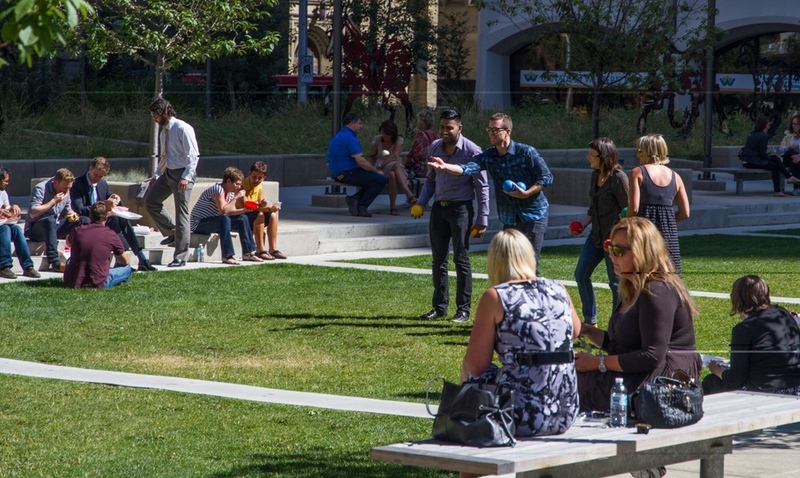 While Stephen Avenue and the Bow Promenade are the busy "power hour" spots, downtown Calgary has many outdoor places where office workers can catch some sun, relax and chat. 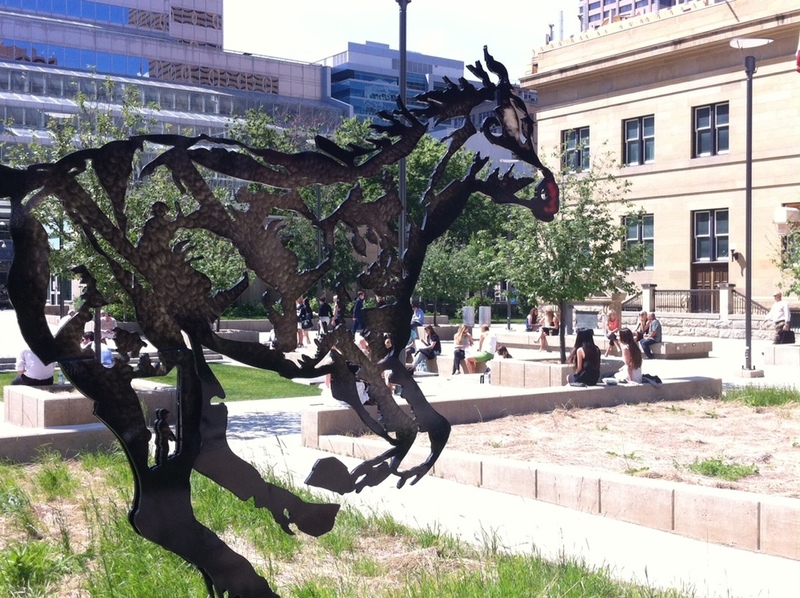 Harley Hotchkiss Gardens is downtown's newest public space created as part of the new Calgary Courthouse complex. It is about as "centre ice, mid-field or center court" as you can get. As a winter city, Calgarians love to sit in the sun whenever they can. A bocci ball game during the power hour at Hotchkiss Gardens. Many of the Stephen Avenue power walkers are heading to Olympic Plaza where they can sit, have their lunch and people watch. Century Gardens on the west side of downtown has a sunny grassy knoll that looks out to a pond, cascading stream and tall coniferous trees to create park-like setting in the middle of the high-rise office towers. Two young children exploring the Century Gardens river while Mom and Dad have lunch nearby. Promenade to McDougall Centre a century old sandstone school that has been converted into the Alberta Premier's office when he is in town. The school sits in the middle of the block with public spaces all around it. Prince's Island is an old gravel bar in the Bow River that has be transformed into a downtown park that offers workers some alone time at lunch. It is also home to the Calgary International Folk Festival and Shakespeare In the Park. There is a steady stream of people heading back to work at the end of the power hour from Prince's Island. This could be the most minimalist downtown park in Canada - no name, no trees, no decorations, just green grass and four picnic tables randomly spaced. This downtown office worker climbs Jaume Plensa's "Wonderland" sculpture on the plaza of the Norman Foster designed Bow office tower during his power hour. While many see downtown Calgary a concrete jungle, you can see from these pictures that it is full of interesting public spaces some intimate and some animated, many with lots of vegetation. All of these spaces are within one square kilometre of each other. 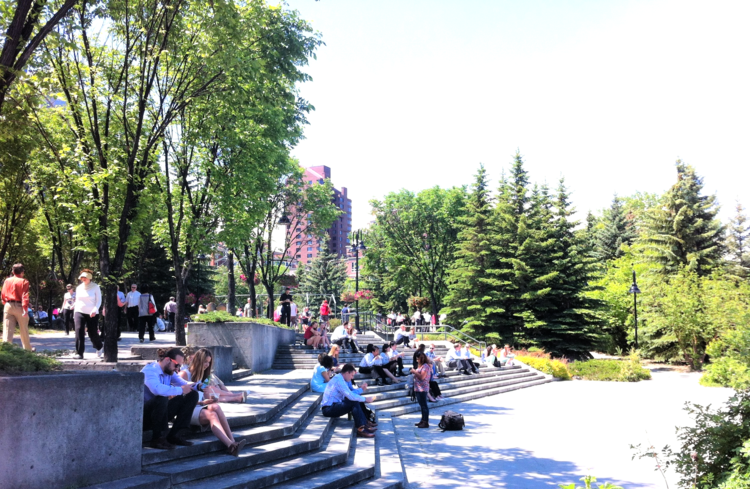 Everyone who works in downtown Calgary has access to an attractive outdoor public space no more than a five minute walk away. 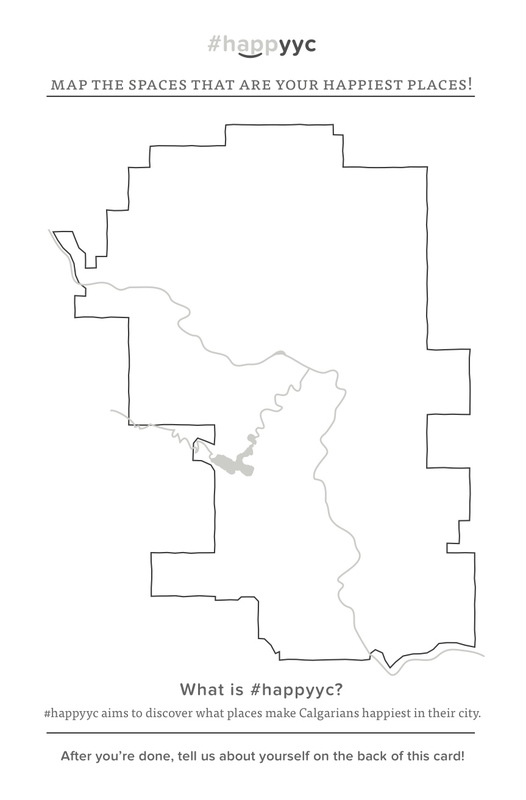 While Central/Memorial Park and Bowness Park were the showpieces of Calgary’s early parks, the Bow River Islands - St. George, St. Patrick and St. Andrew have an interesting history as parks. The Islands were first leased by town council for development of parks in 1887. The three islands were named for the patron saints of the United Kingdom - St. George of England, St. Patrick of Ireland and St. Andrew of Scotland. In the late 19th century, there was no Prince’s Island. It was merely a shifting gravel bar and more of an isthmus. That’s until Peter Prince created a channel in the river (now the lagoon) to allow logs to float to Eau Claire Lumber Mill at the site of the current Eau Claire Market. The St. Andrew Island was created by a lagoon between it and St. Patrick Island which has since been filled in to create one island. Back in1892 through to 1900, a ferry service connected St. George's Island to town, increasing its popularity as a weekend playground. In 1900, a foot bridge was constructed. Construction of the existing St. George’s Island Bridge for cars and pedestrians ridge in 1908 cost of $25,000. At the same time an old Elbow River Bridge was moved to the island’s north side providing a link to the then new Calgary General Hospital and the new communities of Bridgeland and Riverside. In 1910, the federal government gave the islands to the town, on the condition they remain parks. It was the natural beauty St. George's Island that captured the attention of Calgarians and Park Superintendents. The Island was enhanced with the planting of more trees, cinder pathways, fireplaces for picnickers and the Biergarten dance hall band shell. By 1911, the island was home to over 200 weekend picnic parties and the Sunday afternoon band concerts drew an average of 1,500 to 2,000 people (note the population of Calgary was only 43,704). Several attempts were made to create a zoo in Calgary early in the 20th century. The zoo at St. George’s Island began in 1917 when two wayward deer found in the park and were corralled in cages by the dogcatcher near the Biergarten. The deer were so popular, the zoo began to grow under the direction of parks superintendent William Reader. By 1929, the Calgary Zoological Society was formed which was the beginning of St. George's Island as the home of the Calgary Zoo Botanical Garden & Prehistoric Park. This postcard reminds me of George Seurat's 1984 painting a Paris Park titled "A Sunday at La Grande Jatte (see below). Calgary's sense of place was more closely linked to European at the turn of the 20th century than it is today. Calgary was once called "Paris on the prairies." The explosive growth of Calgary, in the early 20th century prompted a need to put some serious thought into long-term city planning. In 1912, British Landscape Architect Thomas Mawson was commissioned by the city to prepare a master plan to address the rapid growth of the city. Mawson's proposal was an ambitious plan on par with Haussmann's rebuilding of Paris during the reign of Napoleon III. The focus of Mawson's plan was on the Bow River, not the CPR railway line. The biergarten, dance hall and eventually tea house on St. George's Island. St. George Island summer amusement park. Prince's Island early 20th century. A landscape designer by profession, Reader emigrated to Canada from England in 1908 when he was 33. He became parks superintendent in 1913. He was responsible for the planning and implementation of establishing Calgary's first parks - Central/Memorial Park, Riley Park, Mewata Park, St. George Island and the Memorial Drive trees to commemorate soldiers killed in World War I. During his 29 year rein as parks superintendent he transformed Calgary from a dusty prairie town to "the garden city of Western Canada."